I love handmade Christmas decorations. I think it’s so nice to have unique and individual looking homes at Christmas time, not just straight from the shop. Don’t get me wrong, there’s a place for shop bought too, but I love to see some homemade bits in the mix. (get the free pattern and tutorial here). 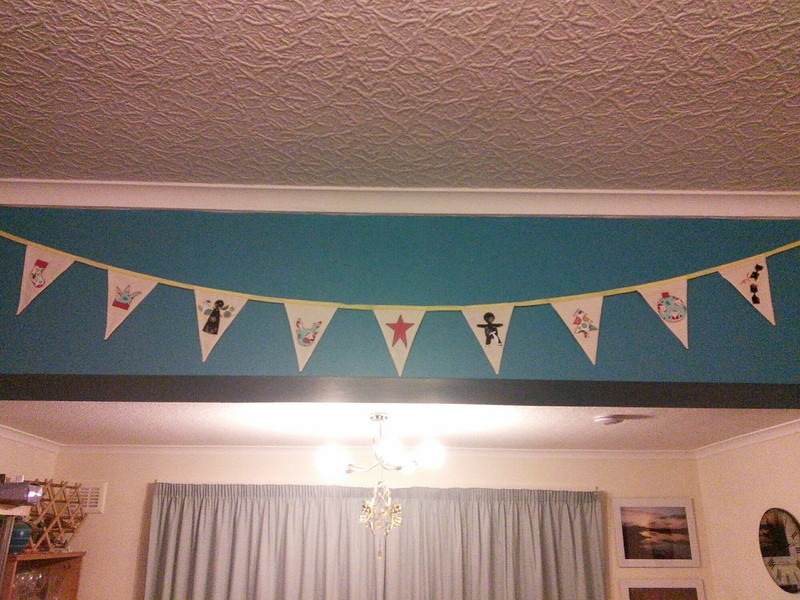 I also made some festive bunting which I don’t think I showed you, but as it went up yesterday I can show you now! 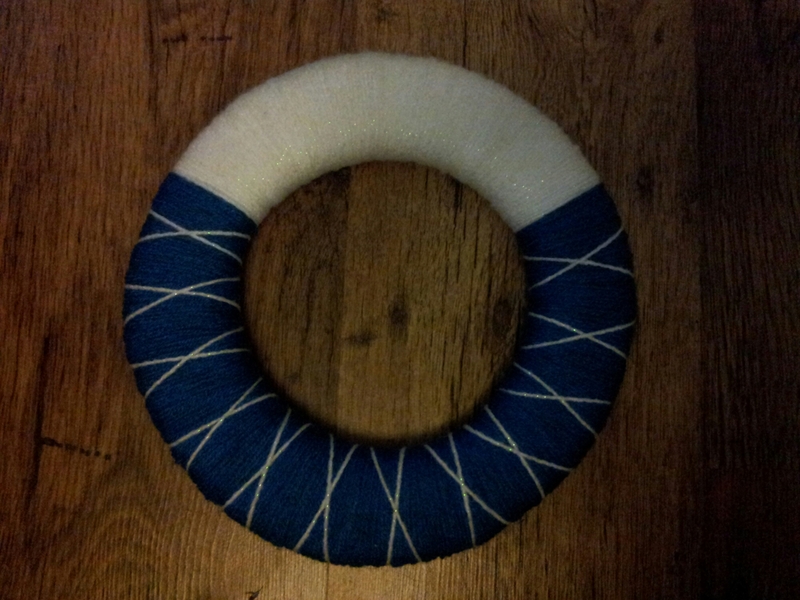 My first new addition this year is a yarn wrapped wreath for our living room door. 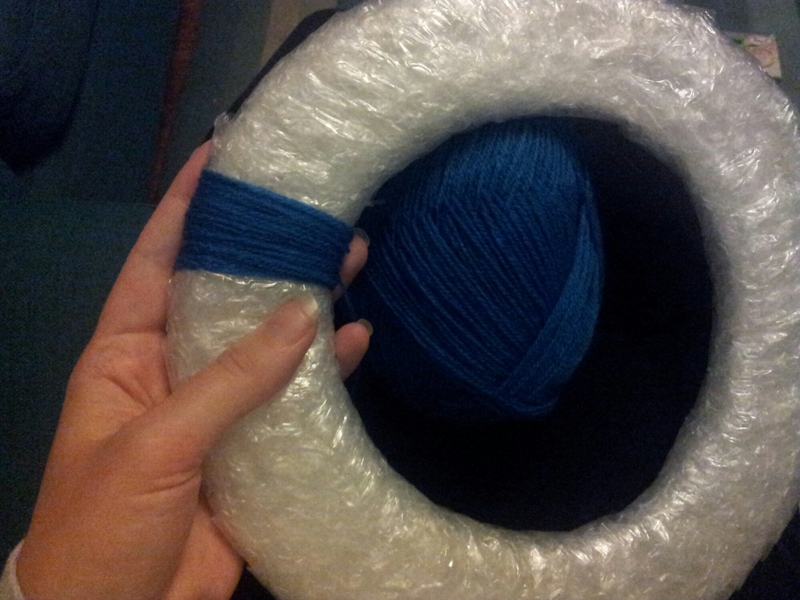 I chose a dark blue and a sparkly white acrylic yarn, nothing expensive, to match our color scheme. 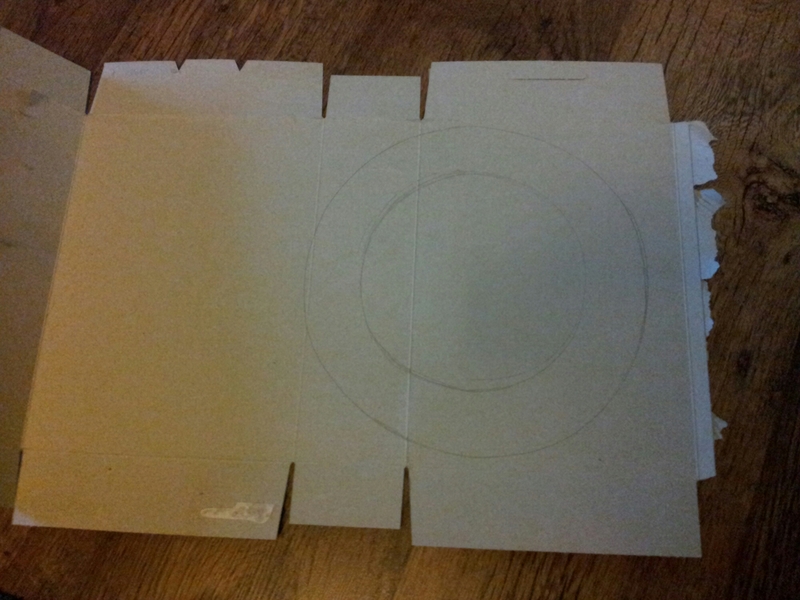 To start with I opened out an empty cereal box and drew 2 concentric circles on it. I made the hoop about 5cm/2″ wide and made the outer circle as large as my box would allow. You can make your hoop any size you like, I’m thinking of doing a mini one for young sir’s wardrobe door, and the technique is exactly the same. Don’t worry if your hoop goes over a bend in the box. It’ll all be stiffened up as we go on. I didn’t want my wreath to be too 2 dimensional, but I also don’t have hours to spend on wrapping the yarn. So I cheated! 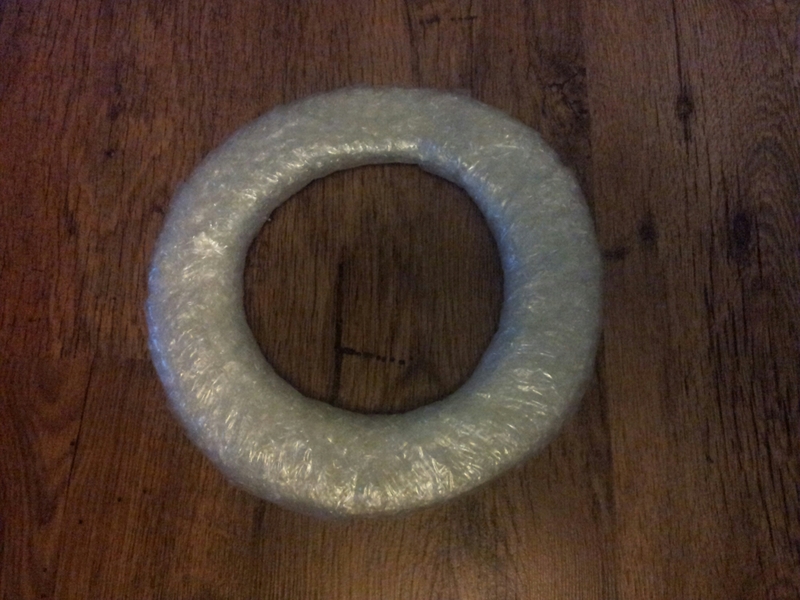 I bulked up my hoop using strips of bubble wrap, about 7/8cm wide, wrapped round the cardboard. 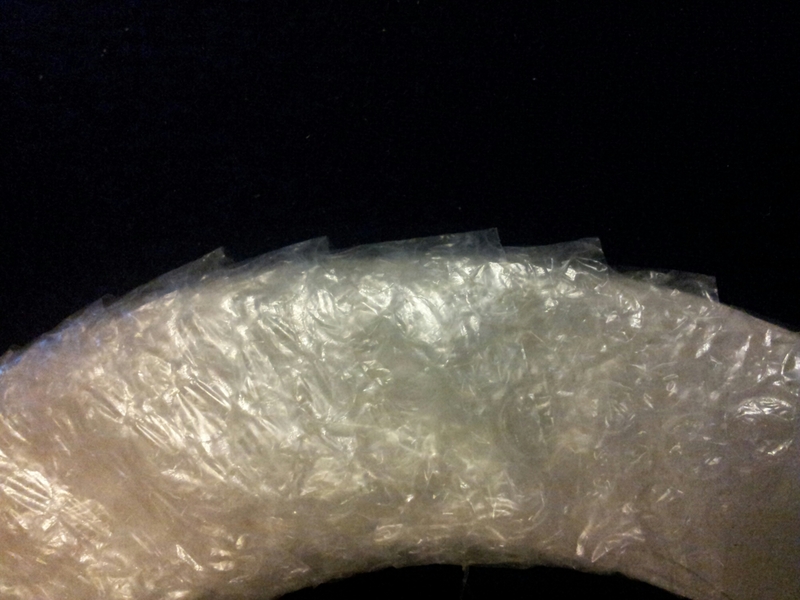 Start by taping one end of a piece of the bubble wrap to the hoop, then start to wrap it around. Depending how much you want to bulk up your wreath will depend how much of an overlap you use. I left about 1.5cm between edges. 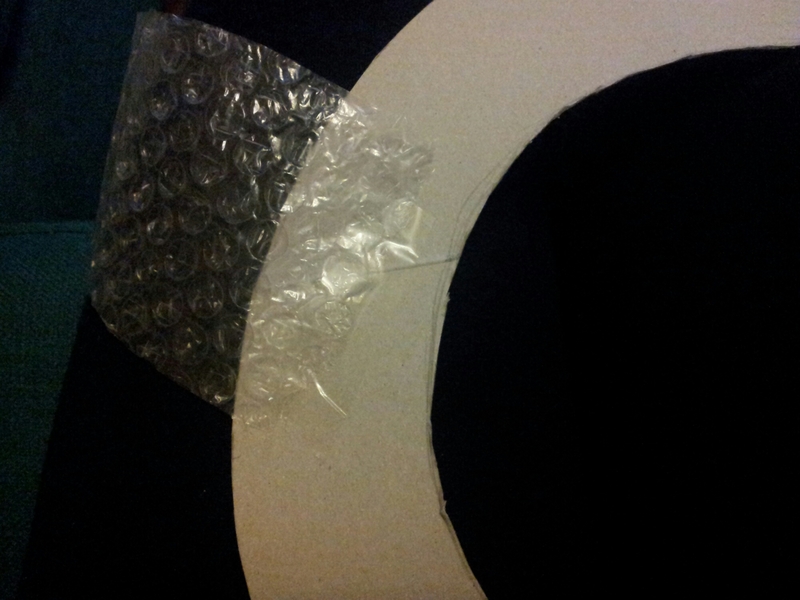 Continue wrapping until the whole hoop is evenly covered, taping the ends of each piece in place. Now it’s time to start wrapping the yarn. 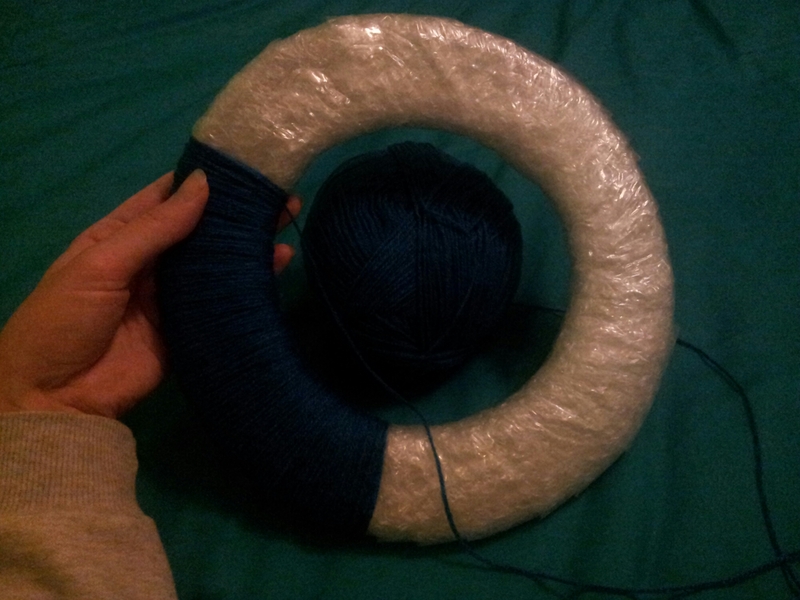 My hoop is big enough to pass the whole ball of yarn through, but if you’re making a small wreath then you’ll have to cut lengths of yarn to wrap. Until the whole surface was covered. I also added some white crosses onto the blue section, which I simply did by wrapping at an angle from one end of the blue to the other end, then back again. Once you’re finished wrapping, use your wool needle to tuck the ends away under the rest of the layers, and your wreath is complete! You can add extra touches to it or leave it as is, depending on the look you want to go for. 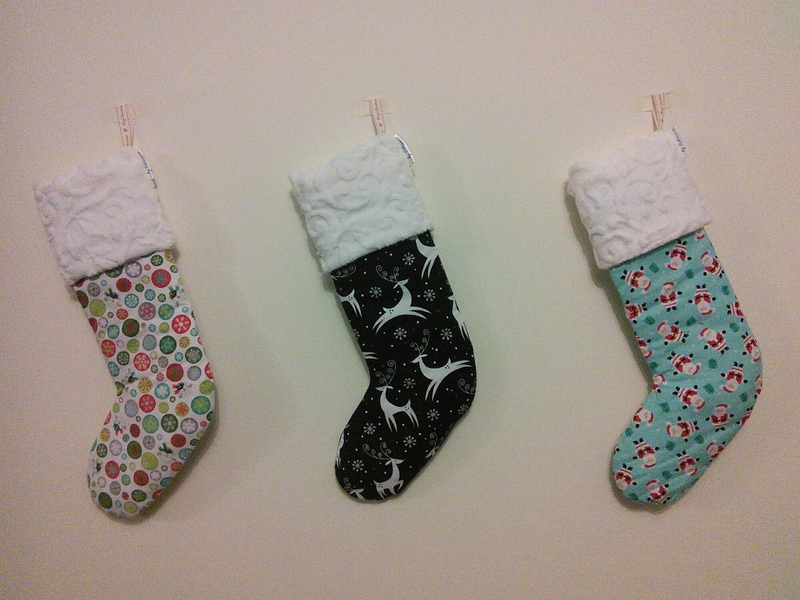 I was undecided between one big pompom in the centre and three small ones hanging from the bottom. 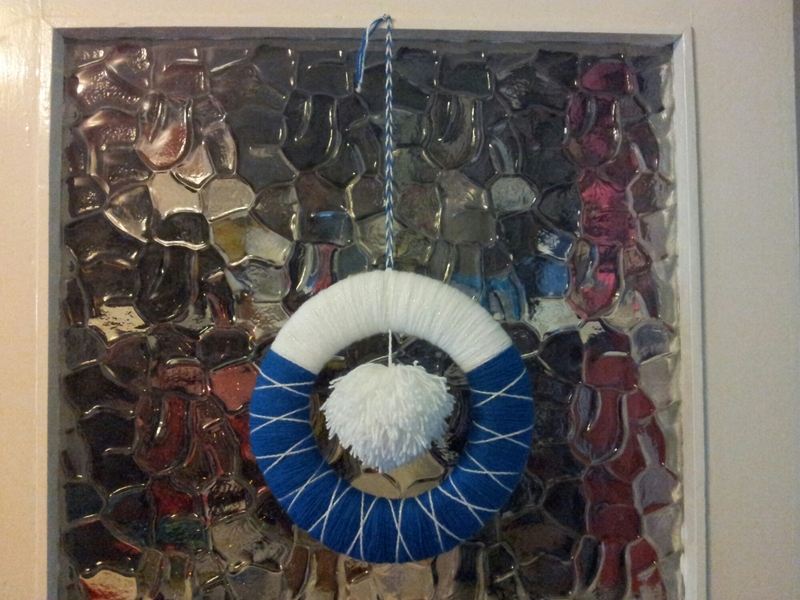 In the end I chose to make one large pompom to hang in the centre of my wreath. 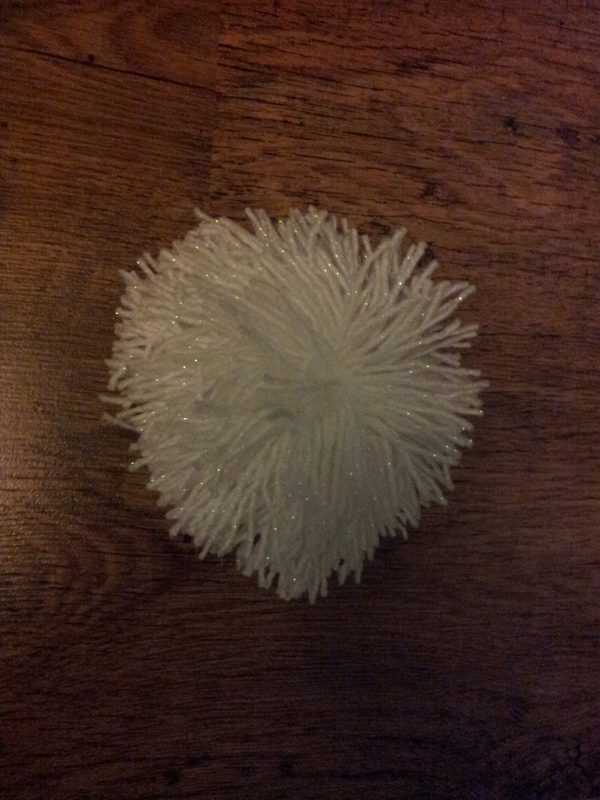 To make it I wrapped my yarn 200 times round the top of a pint glass, which gives a large, floppy pompom. 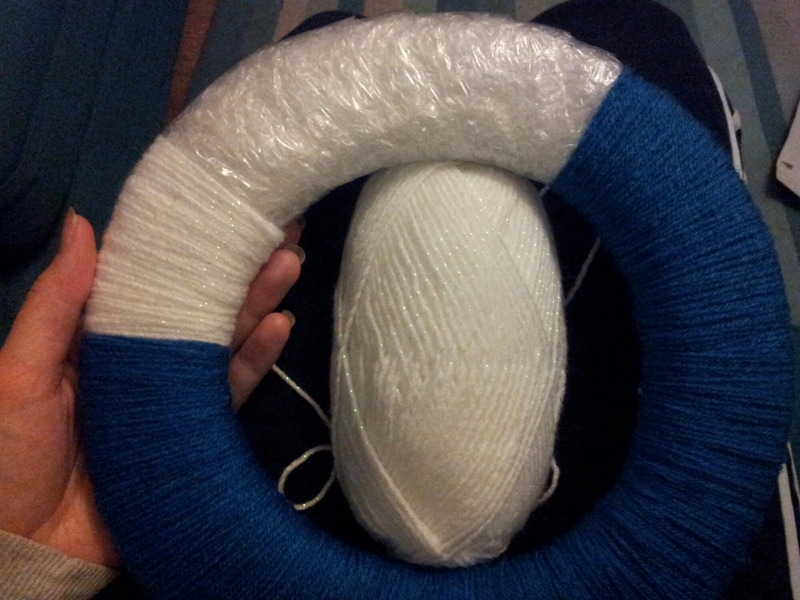 Then tied it round the centre, cut open the loops and trimmed it all to the same length. Some other ideas for finishing touches: you could hang ribbons from the bottom, a bauble in the centre, or even make a dreamcatcher style wreath with a yarny snowflake in the centre. To hang my wreath I made a very simple twisted string using lengths of my two colours of yarn. Ta da!